Kpando Technical Institute has emerged the winner of the Fifth Southern Sector Drill competition organised under the auspices of the National Cadet Corps Ghana, aimed at instilling and promoting discipline among students and the youth. Tsito Senior High School placed second while, Teshie Senior High placed third in the competition. The Southern Sector Cadet Corps organised the competition for 25 Cadet Corps from the Greater Accra, Volta, Eastern, Western, and Central Regions. A statement issued to the Ghana News Agency said the Competition was on the theme: 'The role of drill and discipline towards an empowered youth'. The competition held at Osei Square of 48 Engineer Regiment Teshie camp Accra, saw remarkable performance from all the participating school cadets. Captain Gamfaa Fredrick who represented the Commanding Officer of the Unit as the Review Officer for the occasion in his speech encouraged the Cadets to be disciplined in all aspects of their lives and urged the students to pursue higher education and make good use of their talents. He encouraged the students to focus on their studies and desist from indisciplinary acts that could destroy their future. Mr Emmanuel Dormenyah, the Director of Physical Education at the Ghana Education Service, who represented the Minister for Youth and Sports as the guest of honour commended the leadership of the cadet corps for their efforts at shaping the character of the Ghanaian youth through a multifaceted cadet corps activity which was both physically and mentally challenging and rewarding. He added that the existence of a cadet corps unit in almost every school in recent times was a healthy development in this era as it signified the dawn of realisation that, firm discipline coupled with military training given at the appropriate time and place and modified to suit young men and women could help create an orderly society. 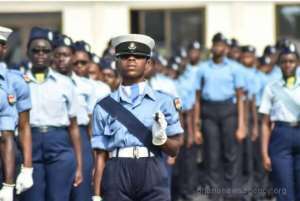 He cautioned the cadet to maintain a high standard of discipline submitting only to constituted authority because it was the best way that a conducive environment could be created for them. He further urged the cadets to avoid imposing themselves as custodians of the law on their campuses as this could affect their lives and colleagues negatively.